I am so delighted to be able to announce that Edward and Anastasia Bear have some thrilling news! The stork has made a delivery! Baby Brownie Bear has arrived, safe and sound and you can see for yourself that baby is truly adorable! BTW, if you don’t know what I am talking about, Edward and Anastasia Bear are tiny knitted teddy bears that I designed for the magazine, ‘Your Knitting Life’, back when it was called, ‘Knitting Today’. Every issue has a different set of outfits for Edward and Anastasia, including their wedding outfits. So, that makes them extra special to me! Love them. They are wonderful. How cute! I might have to get the issue on my Kindle so I can see it sooner. So cute baby bear ! How wonderful for all of us that Edward and Anastasia Bear have had a wee one, and delivered in a very beautiful way. The image of the stork and BBB being delivered has such a wonderful feel to it, and BBB looks to be full of excited anticipation about what is ahead. I love that Baby Brownie Bear is not saddled with any preconceptions about its gender! Oh! getting the magazine on Kindle is brilliant! So, does it live forever in your Kindle once it’s downloaded? I love being able to upload pdf’s into my kindle, and, I have pdf’ed my original Edward and Anastasia designs and uploaded them into my Kindle, so I can knit up any extra goodies that are needed. I still do all my design work the old fashioned way, beginning with sketches, then writing out each row by hand, and eventually transcribing into the technical correct pattern form on my computer when I have worked through however many iterations it takes to get it right. Thanks so much, Carolee! Brownie really is adorable! Such a sweet wee handful! 🙂 Fun! 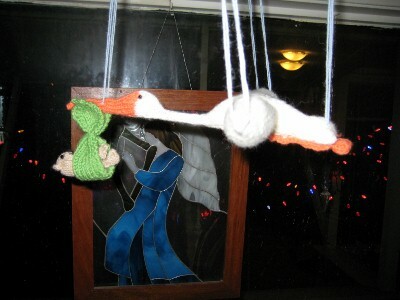 Figuring out the armature for the stork was a proper challenge! LOL, and involved some gnashing of teeth! But, that’s my job- take a tricky idea and make it work! 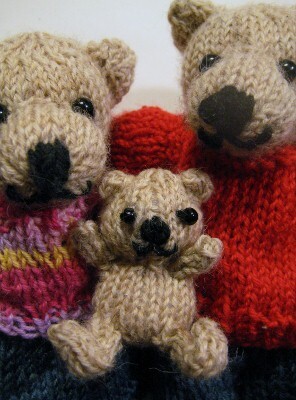 I have to confess that the baby bear began as ‘Daisy’, but my editors felt that it was really important to have the baby bear be gender neutral so that people could knit BBB up with either gender in mind! I’ve designed the first set of clothing for BBB, and it’s already in the editorial office. Even though I didn’t know at that point that Daisy had become Baby Brownie Bear, I was careful to choose colors that were totally gender neutral. I figured that it was most appropriate to do that. I was very pleased by my editors’ mindfulness in making the baby be gender non specific- it was an ‘oh, yes, OF COURSE’ moment when I saw that they had done that.